I just received word that my good friend, our good friend, @TerrenceWing, passed away earlier today. Still in shock. Will say more later. I've been following the twitter stream and just checked out his Facebook page. Terrence was a big, hands on, supporter of social media. Amidst the sadness of losing him, I'm discovering a new found hope in the new technologies that are so often blamed for ill will. I see the number of lives touched by one man in an endless stream of twitter commets and Facebook postings. And we will always have his podcast interviews with Rick. 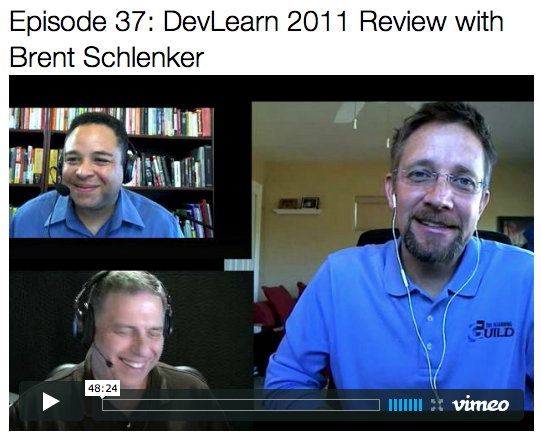 Rick and Terrence hosted a great podcast called eLearnChat. I was honored on 2 occasions to be a guest. They had the opportunity to talk with so many people in our industry as well as those on the edges. I would highly encourage you to watch a few. Social media can teach us a lot. But when someone dies there is an intense moment of reflection...at least for me. I am a firm believer in people, NOT technology. The technology simply enhances and amplifies our ability to reach other people. Soon, the wonder of this new technology will disappear and we'll be left with just the amazing social enhancements it provides. But its the ability to connect with many more people, more closely, that makes this technology special. I dare you to walk in the footsteps of Terrence Wing and embrace social media with the same passion and enthusiasm. Do it! And share your skills with a friend or colleague. It would be a fitting tribute to Terrence. And honestly, if you can do nothing else today just try sharing a smile with someone... anyone. I will never forget that big smile he shared so freely with everyone he met. We miss you Terrence! Rest in Peace. A lovely remembrance. Terrence was such a warm, enthusiastic, joyful person! It is stunning and terrible news. I am so shocked. In a cloud of disbelief and inner thoughts at the news of the passing of one of 'us'. So nicely said Brent, thank you I could not find the words right now. What I realise however is the fragility of it all. Add one more thing to Brent's list. Share something today, pass on a little bit of knowledge so that the world can be a little richer. Just as Terrence did. RIP media friend. Brent, having been the messenger of this shocking news, want to thank you for this tribute to Terrence. Let me add my voice to your call to embrace social media. They allowed me, living far away over that ocean, not only to have a great PLN but to connect with people that became real friends. Was an early guest on eLearnChat and enjoyed chatting during live sessions with Terrence and other attendees tremendously. As a tribute to Terrence, I signed up for a FB-account, only SoMe I didn't embrace yet. 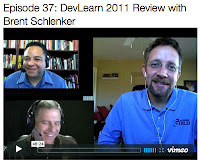 And remember meeting Terrence for the first time on DevLearn, his big 'real' hug, and a second one sent by Rick. Awed, amazed and supported by the warmth, positive energy emanating from Twitter and other social networks. Thanks, Terrence. I'm so very, very sad that Terrence has been taken from us so soon, so young. He was always so approachable, so friendly, so intelligent in his comments and so generous with his time. He was not a common man, he was among the best of the best. I had told him more than once how much I admired him; now I wish I had said it even more. I'm shocked and saddened to hear this news. My deepest sympathies to Terrence's family and friends.